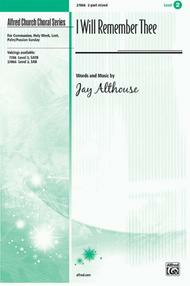 I Will Remember Thee composed by Jay Althouse. Choir Sacred. 2-Part Choir. Choral (Sacred); Choral Octavo; Worship Resources. Church Choral Series. Communion; Easter; Holy Week; Lent; Palm Sunday; Sacred; Spring. Grade 2. Choral Octavo. 8 pages. Published by Alfred Music (AP.27866).About Alfred Church Choral SeriesThe Alfred Church Choral Series (ACCS) includes scripture references and seasonal applications in every octavo. The series includes original works, choral masterworks, and folk, gospel, hymn, and spiritual arrangements.